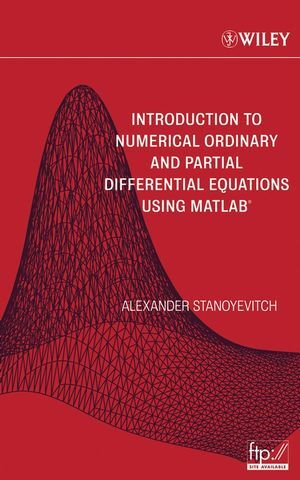 Introduction to Numerical Ordinary and Partial Differential Equations Using MATLAB® teaches readers how to numerically solve both ordinary and partial differential equations with ease. This innovative publication brings together a skillful treatment of MATLAB and programming alongside theory and modeling. By presenting these topics in tandem, the author enables and encourages readers to perform their own computer experiments, leading them to a more profound understanding of differential equations. This textbook can be tailored for courses in numerical differential equations and numerical analysis as well as traditional courses in ordinary and/or partial differential equations. All the material has been classroom-tested over the course of many years, with the result that any self-learner with an understanding of basic single-variable calculus can master this topic. Systematic use is made of MATLAB's superb graphical capabilities to display and analyze results. An extensive chapter on the finite element method covers enough practical aspects (including mesh generation) to enable the reader to numerically solve general elliptic boundary value problems. With its thorough coverage of analytic concepts, geometric concepts, programs and algorithms, and applications, this is an unsurpassed pedagogical tool. ALEXANDER STANOYEVITCH, PhD, is a professor of mathematics and has served as department chairman at the University of Guam. He completed his graduate work in mathematical analysis at the University of MichiganAnn Arbor. He has published several articles in leading mathematical journals and has been an invited speaker at numerous lectures and conferences. Dr. Stanoyevitch makes extensive use of MATLAB in most of the classes that he teaches. PART I: INTRODUCTION TO MATLAB AND NUMERICAL PRELIMINARIES. Chapter 2. Basic Concepts of Numerical Analysis with Taylor’s Theorem. Chapter 3. Introduction to M-Files. Chapter 4. Programming in MATLAB. Chapter 5. Floating Point Arithmetic and Error Analysis. Chapter 7. Matrices and Linear Systems. PART II: ORDINARY DIFFERENTIAL EQUATIONS. Chapter 8. Introduction to Differential Equations. Chapter 10. Boundary Value Problems for Ordinary Differential Equations. Chapter 11. Introduction to Partial Differential Equations. Chapter 13. The Finite Element Method. Appendix A: Introduction to MATLAB’s Symbolic Toolbox. Appendix B: Solutions to All Exercises for the Reader.